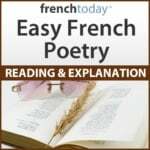 Today, I’m going to present you a rather complicated poem, which speaks of French historic characters and refers to legends from France and the Roman and Greek antiquity. Rather dark, yet full of hope, this poem is gorgeous and profound, and one can find a new meaning with each reading. And the treillised vineyard where the grapevine unites with the rose. Am I Love or Phoebus ?… Lusignan or Biron ? The sighs of the Saint and the Fairy’s screams.